Yes, it’s spring…Yes, the weather is getting nicer… Yes, I’m excited for summer too. But that’s not what I’m talking about in this case. All of us on L-Tron’s Edu-Tech team get excited this time of year because we love running our 4910LR Driver’s License Reader promotion – and it’s back again this year, for the 3rd year in a row! If you are reading this wondering, “What is e-Citation?” or “What’s so special about the 4910LR?” then I definitely would recommend clicking through the links to learn more about how the 4910LR DL Reader integrates with electronic citation software to drastically improve efficiency and accuracy. Just think – NO more handwritten reports. NO more dismissed tickets due to manual/handwritten errors. We were recently talking to one of the local Officers we work with, and he was explaining to us that he and his colleagues would actually pick and choose patrol cars for their shifts based on whether they were equipped with the 4910LR DL reader or an outdated scanner. He said that if they got “stuck” with an old scanner that didn’t perform well, they would have to resort back to handwritten reports – which took a lot of extra time and led to costly errors for the department. There is a reason why L-Tron’s Law Enforcement solutions have been implemented in thousands of municipalities across 40+ states over the last decade or so. It works! Here are the details on this year’s 4910LR Driver’s License Reader promotion. 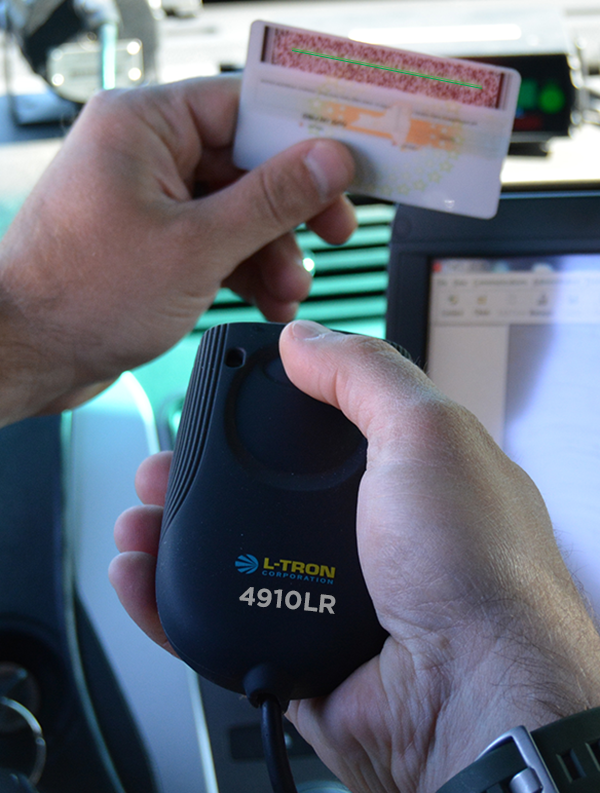 L-Tron is offering a $30 instant rebate to agencies off the purchase price of each 4910LR, with the trade-in of an outdated driver’s license barcode scanner. For agencies without scanners to trade in, L-Tron is offering a $15 instant rebate of the purchase price of each 4910LR. The promotion runs through Friday, June 17, 2016 so start collecting those old scanners and get ready to trade-in and trade-up!